SensorData Technologies Introduces Industry-Exclusive Wireless Coupled Flange Drive Rotary Torque Transducer for Extreme High-Vibration Environments | SensorData Technologies, Inc.
FOR IMMEDIATE RELEASE – May 27, 2014 – Shelby Township, Michigan, USA – SensorData Technologies (SensorData) (www.sensordata.com), a renowned industry supplier of standard and custom force, torque, load and strain sensors, transducers and related instrumentation, has announced the global market introduction of the Model BT4000 Series Wireless Coupled Flange Drive Rotary Torque Sensor. The BT4000 Series is the only transducer of its kind that offers high-reliability true Bluetooth wireless rotary torque sensing in extreme high-vibration environments, where most torque transducers experience premature wear and failure. In particular, the damage of sensor power rotors during torque transducer installation and/or operation can result in often-costly and unforeseen downtime. The series offers highly reliable transmission of measured torque data, requires relatively little installation space, and can measure torque up to 8000 Nm at speeds up to 7,000 rpm, with analog voltage, digital or frequency signal outputs. Design of the BT4000 Series features specially encapsulated on-board electronics that provide strain gage bridge excitation, bridge output amplification, and offers amplified signal conversion into a 16-bit digital word. 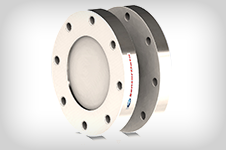 This immediate signal conversion results in the significant reduction of conducted noise effects that are common within other rotary torque measurement systems. The on-board transducer electronics also facilitate remote shunt calibration. Due to its Bluetooth wireless topology and induction power supplied to the rotor, the BT4000 Series is immune to EMI, ground loop interference, as well as adjacent metal effects. An optional zero-velocity speed sensor is also available. Each BT4000 Series unit is supplied with a Bluetooth wireless remote base station. The station is equipped with three analog output options and a USB data port for seamless connection to a PC or other device. Bluetooth operates in the unlicensed 2.4 GHz ISM band and employs a frequency hopping to combat interference and fading. Any electronic device equipped to receive 2.4 GHz Bluetooth data can receive signals from the BT4000 Series, for subsequent processing. With quick, easy and foolproof installation, the SensorData Technologies BT4000 Series may be used as a seamless drop-in replacement for any legacy application in which prior torque sensor installations may have damaged sensor power rotors. Or, where other rotary torque measurement solutions have previously failed due to the presence of excessively high vibration levels.